As a Fortune 100 insurance company with 2,000 offices worldwide and more than $500 billion in assets under management, the Client is one of the largest life insurance companies in the world. Each year, the company hires more than 80 interns and entry-level staff for their development programs, many from universities in the U.S. Campus recruiting is a critical part of their human resources strategy. The task of seeking out, vetting, and hiring those candidates falls to Carrie S., a one-woman recruiting army who might visit about 15-20 schools, and visit a single core school up to 15 times a semester. Carrie is on the road for months at a time meeting hundreds of prospects. Streamlining this process—including the many logistical and administrative tasks associated with collecting paper resumes and interacting with students at career fairs and campus recruiting events—became a top priority for campus recruiting at the company. During the campus recruiting season, Carrie was so busy traveling she wasn’t able to process the hundreds of resumes she collects in one season. Rakuna removes the paper from the work. The Client relies on the two-pronged solution Rakuna offers. 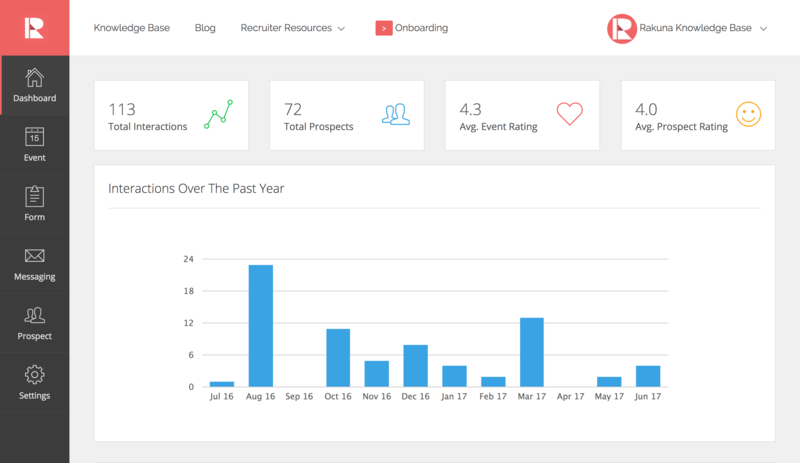 First, Carrie leverages the Rakuna mobile recruiting app to capture the data from prospects’ resumes with its easy snapshot technology. This allows her to focus on talking with the prospects rather than record their information by hand. She’s also able to qualify the candidates in real time and send emails out to them right after the career fair. Second, Carrie uses the recruiting dashboard to create a streamlined candidate database using the data extracted from resumes photographed electronically at the career events. She’s able to search and filter candidates in the system and connect with candidates using email templates she creates and sets up upfront using the Rakuna software. Rakuna has saved the Client time and money. Carrie is able to follow up with everyone she meets via email, track how many touchpoints turned into applicants—and track data back to a candidate’s first touchpoint, a critical dataset that helps the team focus on the kind of events that are effective in converting students to applicants. As an added bonus, she’s become known at career fairs for having the cutting edge technology that impresses prospective candidates and other companies.